On the edge of Hersonissos to the west, lie a series of small inlets and bays separated by rocky cliffs vibrant with limpets, small crabs and other sea animals. The sea is almost always calm and the warm turquoise waters are most welcoming. The bay in the far end serves as a nudist beach. There are seabed and umbrellas for rent and a few but exquisite restaurants and bars. 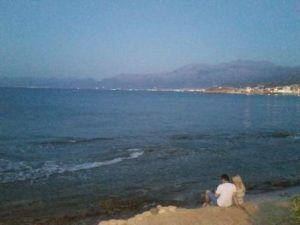 The area of Saradari is idyllic to watch the dark sea twinkling as the full-moon rises above Hersonissos port. Star Beach is more an amusement park on the seaside than a beach. Star beach is most famous for musical and themed home parties organized almost on a daily basis featuring famous DJ’s. But there is something for everyone in the 4 acres it occupies. Several water pools- including a kid’s pool- water slides, beaches, a spa center and water sports are all part of the Star Beach experience. The four bars and the three restaurants of the park offer a big choice of foods and drinks at a very reasonable cost. Entrance to the Star beach park is free. New York is a popular all-day Beach bar and restaurant that doubles as a club at night. It is situated right in the middle of the port of Hersonissos. 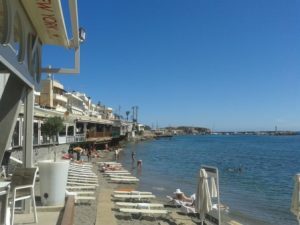 Sea water is almost always calm and the views are great both from the beach and the restaurant. Friendly staff serves fresh drinks all day long on the beach, where you can rent sun-beds and umbrellas a daily basis. 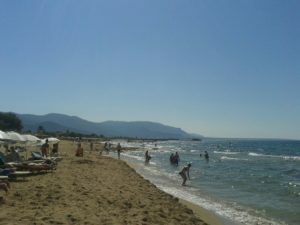 Annissaras is a big sandy beach extending for more than 3 killometers from Saradari in the outskirts of Hersonissos to Analipsi. Annisaras is home to some of the biggest hotels in the area operating on an all-inclusive basis. The rocky seabed makes it an ideal destination for scuba diving and snorkeling. A great place to enjoy an evening walk as the red sun sets into the blue sea. 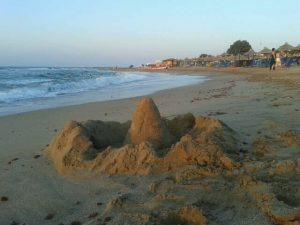 On the verge of the ancient palace of Malia lies a big beach, widely known as arhaiotites (antiquities). On the west of side is Potamos a smaller less crowded beach. Potamos is covered with white sand and small dunes, where white sand lilies grow in August and September. The beach is surrounded by a wild life reserve- home to several species of birds and wild flowers, such as the endogenous Cretan orchids. You can rent a set of 2 sun beds and umbrella for just 5 Euros per day. Refreshments, Snacks and Lunch are available from the bar-restaurant on top of the beach.